The finest Sunday of the summer. The sun shone, the wind blew. A brilliant day for a sail. But there was something wrong with the car. . . and, as I have damaged my thumb, sailing was out. So we took the train to Exeter . . .
Teignmouth – Dawlish – Dawlish Warren – Starcross – Exeter St Thomas. This is the coast-line – to be more exact, Isambard Kingdom Brunel‘s line, the line of his Atmospheric Railway. The sea sparkled the way it does here when the wind blows from the west and stirs the calm surface to catch the morning sun. A mile or so off the beach, a ketch, in full sail, was reaching across the bay. Each time we emerged from one of short tunnels through the cliffs, she had stretched away further south towards Hope’s Nose and Berry Head. 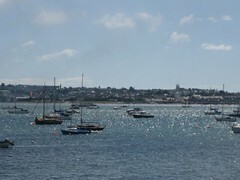 We stopped in Dawlish, then Dawlish Warren, (disembarking families carrying beach clothes and picnics), before we turned inland along the Exe estuary. 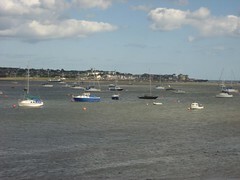 The tide was high and the Folkboat (I always notice her) was on her mooring. I had thought of keeping Blue Mistress here before settling on Plymouth. 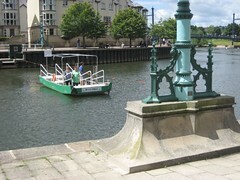 It seemed that people were taking to the water wherever we looked. In Exeter, they were enjoying the river, including the short crossing on Butts Ferry. 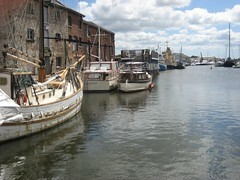 The ferry is left over from the wonderful and much lamented Exeter Maritime Museum. The warehouse that housed the museum is still there. I have always thought, whimsically perhaps, of the boats moored along the canal as ganging up in sympathy for the small gem of a museum that has been lost forever. We had come to Exeter to visit our son and spent the day doing ordinary things – walking and talking, greeting and eating, before returning to the train. Along the Exe, the tide was now very low and the Folkboat closer to the shore – well, close to the bird flocked mud flats. 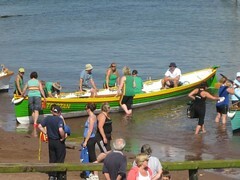 And in Teignmouth, in the late afternoon, there was gig racing. On shore, rowers were hurrying to their boats, busying themselves before the start of their race. 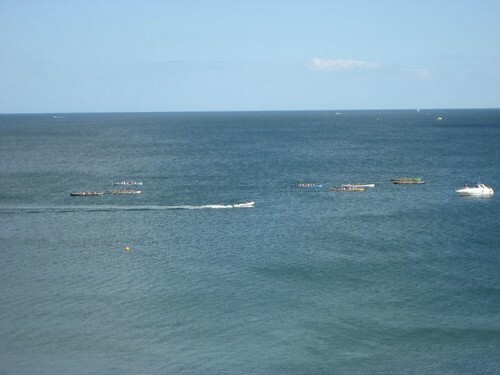 Offshore they were heaving on their oars, some boats flying, some labouring, all working to a common cause. Today the rowers had been out ‘walking the wire’, while we were ashore ‘waiting’ and doing ordinary things – walking and talking, greeting and eating . . .
and we were all having a thoroughly enjoyable time.